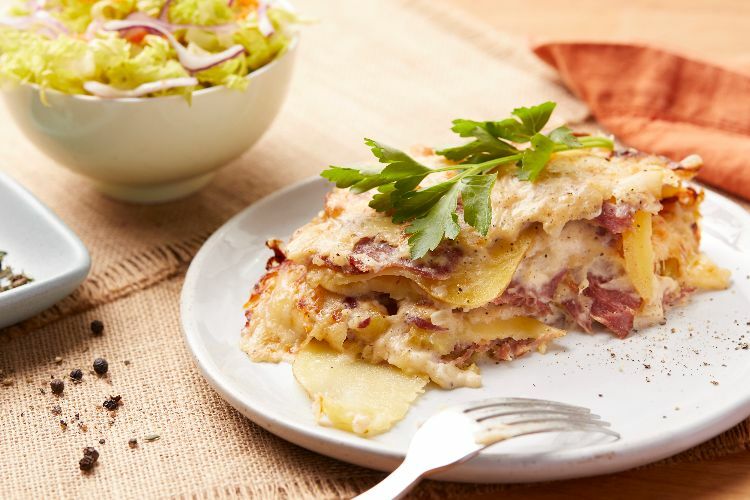 Tender potatoes layered with bits of ham, a classic bechamel sauce and melted cheese make this comfort food at its finest. Whether you serve this dish as an indulgent side for a holiday dinner or as a main dish casserole, the recipe is sure to win fans. I like to use a flavorful Gruyere or other Swiss cheese. The key is to slice the potatoes thinly and evenly so they all cook at the same rate. For an even richer dish, substitute cream for some of the milk. Sprinkle a bit of minced parsley over the top after it comes out of the oven for a top-notch presentation. Preheat the oven to 350 degrees F and grease a 13-by-9-inch baking dish with butter. In a large skillet, melt the butter over medium-high heat. Add the onions and cook, stirring, until they soften, about 4 minutes. Sprinkle the flour over the onions and continue to cook, stirring for 1 to 2 minutes, until the flour just begins to color. Slowly add the milk and cook, stirring constantly, until the sauce thickens. Remove from the heat and stir in one-third of the shredded cheese. Stir in salt and pepper to taste. Arrange half of the potato slices in the baking dish. Layer half of the ham slices over the top, sprinkle on half of the remaining shredded cheese and pour over half of the sauce. 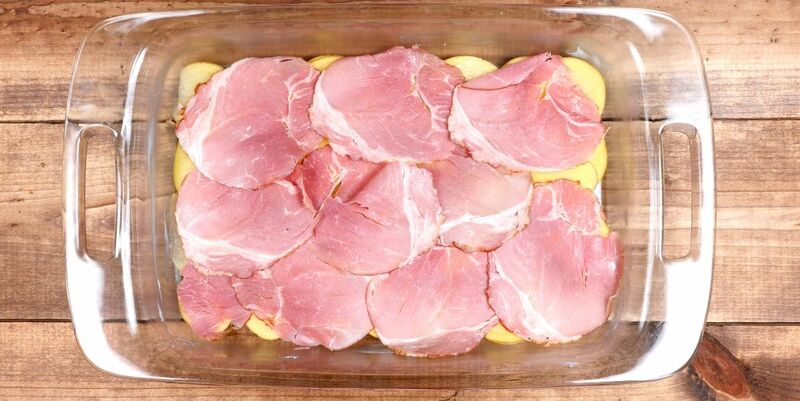 Arrange the remaining potatoes in another layer, and top with the remaining ham, the remaining sauce and the remaining cheese. Remove the foil and continue to bake until the top is browned and the sauce is bubbling, 15 to 20 minutes more.